Tonight, at Rio’s Sambadromo, it is Segundo, the second night of the big Carnaval parade where six of the twelve top Samba Schools battle it out for the highest place of all. Seven years ago, I was there. The stark concrete stands of the Sambadromo were a rippling landscape of colour; yellow and red for Porta da Pedro, from Sao Gonzalo, across the Rio Niteroi Bridge, red and white, for Salguiero, from the famous Tijuca favela. Green and gold for Imperatriz, from Ramos, blue for Portela, pink and green for Manguera and gold, yellow and blue for Viradouro. In Frisor stall 12, Fila row B of Setor 9, the Tourist Section, we ’re spitting distance from the avenue. We’re pampered and protected; snacks, drinks, Carnaval paraphernalia are ferried to our seats, security guards watch over us. We’re a foreign world apart. Tourists are precious to Carnaval and to Rio but they’re also fair game in a city where one quarter of the population lives below the poverty line. So the wise traveler, at least at Carnaval, toes the tourist line. Carnaval demands active participation from beginning to end, with hips, feet and voice fully engaged and all senses on high alert. So when Momo sambas down the avenue at 9 pm, the crowd rises like a wave beside him, cheering, clapping, whistling, waving and dancing. Fireworks explode over Avenida Presidente Vargas, the first strident line of Porto da Pedro’s samba enreda splits the air, the drums begin and everyone turns, craning over heads, cameras ready, hips swinging, feet shuffling, cheering, waiting for the first glimpse. The Vanguard commission leads the parade. Here 12 to 15 dancers, in a highly choreographed and spectacular performance, introduce the school to the crowd. They are followed by the arbre alas, a float which carries the school’s emblem and symbols of the theme. Each section of the parade is divided into wings, or ala, of 20 to 100 people, all in different costumes. The ala are the building blocks of the parade – legions of foot soldiers, all playing the different characters in this gigantic drama – local people who have won their costumes in dance contests and tourists, who have bought theirs, taking the shuffle of a lifetime down Sapucai under heavy head-dresses. Between each wing up to 10 floats carry special guests and gorgeous samba dancers in fabulous costumes. The flag bearers, the porta bandeira and mestre sala are the community’s little people, the humblest even of the most humble favela, known often only by their first names, they are King and Queen at Carnaval. 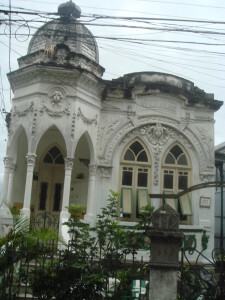 Once, the mestre sala was armed with a knife to protect his lady from attack. Now he merely draws the crowd’s attention to her. The passistas are a small wing of 15 to 20 of the finest samba dancers. Competition winners, they are a highly honoured star turn. The School’s Carnaval Queen is chosen for her beauty, self-assurance , congeniality and of course, her samba skill. The Carnaval Princesses are the second and third place winners. Plumed, be-jewelled, glittering and gorgeous, theirs are the figures that launch a thousand flash-bulbs as they samba along Sapucai. Traditionally, they were the beautiful mulatta girls from the favelas, complete unknowns. Many of them still are. The bahianas, a group of at least 80, represent the soul and the African roots of Carnaval. They are the whirling grandmothers in the traditional wide crinoline skirts of the north-western state of Bahia State, where they are the shamans, the high priestesses. They receive their costumes as a token of appreciation of their years of service to the school. The little bahianas is the kids group. 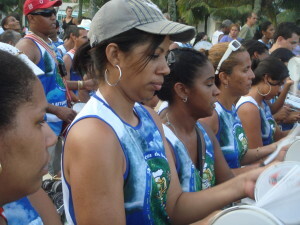 The Raina da Bateria (Queen of the drummers) is the beautiful samba dancer who leads and motivates the drummers. Some are celebrities, others are nameless newcomers whose stars will surely rise once they shake their amazing “bum-bums” through the Sambadrome.. The bateria is a contingent of 250 to 350, drums whistles, rattles and shakers. They are the energy and life of the parade. Behind them comes the sound truck carrying the male vocalist, usually a legend in his own favela. The harmonia or stewards of the flow keep the parade moving in time and on time and countless “forca” push or pull floats. The theme binds the whole gigantic spectacle together. It is stated re-stated and underscored in countless ingenious ways in floats, costumes, props and choreography. It links the vast cast of characters in this epic drama. It runs through the samba enreda. Themes range from deep and meaningful, to light and simple and from local to universal. Thankfully, each school’s theme is helpfully outlined in the Carnaval programme, because it is easily lost in the multitude of detail. It was a long night. 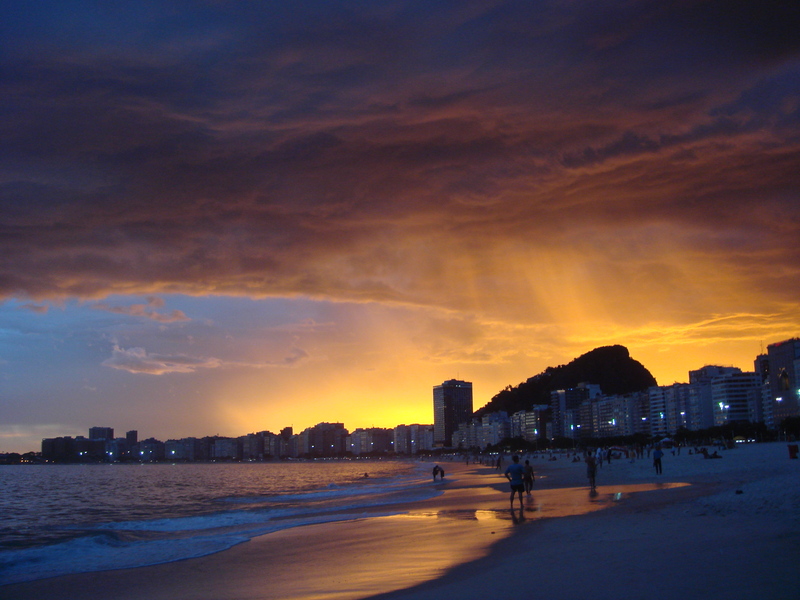 As Viradouro turned the last page on the story of Bahia, the sky was light. The peace heart which had shone all night on the hill above the green neon arches had faded into the forest. 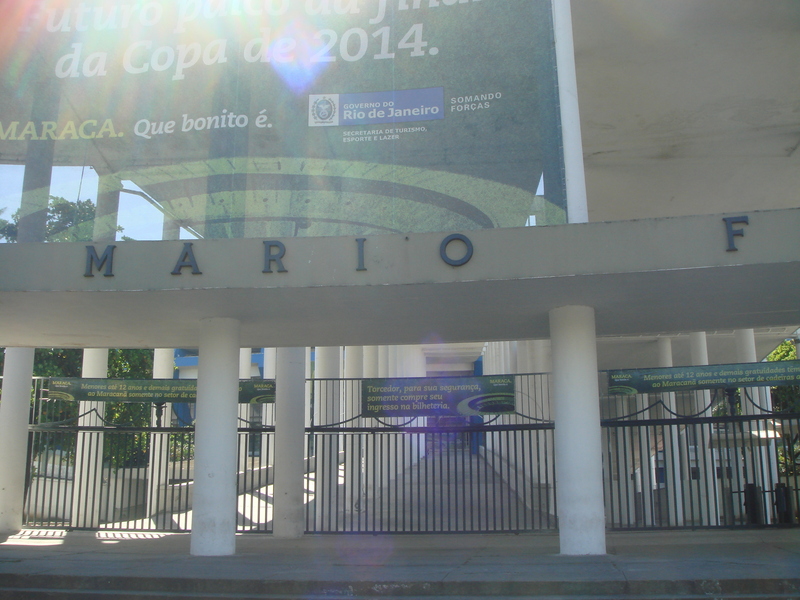 Soon, the die will be cast, and Rio will be waiting with bated breath to hear the outcome of Carnaval 2015. The high point of Carnaval in Rio de Janeiro, is the Special Schools’ parade which plays out this Sunday and Monday night at the Sambadromo. Described by the Mayor of Rio de Janeiro as the biggest folk festival on the planet and the most spectacular show on earth, the Special Schools’ parade is all of that and more. It is a celebration of the Brazilian people and their rich mix of cultures, of Catholic and Condomblé religious traditions, of characters from ancient civilizations and entities from the new world. 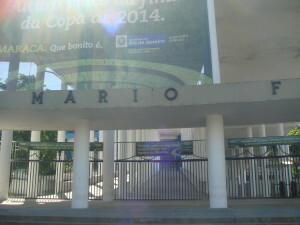 It’s a stage where the stories of Brazil itself are told. The size of this spectacle is staggering. 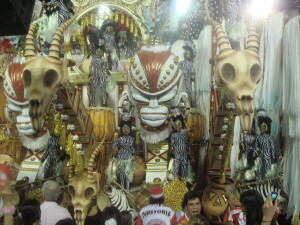 Up to 5 thousand people take part in each Samba School’s procession. Of all ages, of all races and from every corner of their communities, they represent the huge melting pot that is Brazil. There are administrators, resplendent in the colours of their school. There are and teams of technicians in t-shirts. Countless “forca” push or pull floats carrying a huge cast of singers, dancers and acrobats. Conductors orchestrate the hundreds of different drums, whistles, shakers, rattles and shakers of the Batteria. “Directors” and “harmonia” keep the endless ranks of foot soldiers moving in time, on time and smoothly; loyal school members who have practised for months, the tourists, taking the shuffle of a lifetime through the sambadrome, the sambistas, the carnival goddesses, plumed, be-jewelled, glittering and gorgeous, the bahianas, the whirling grandmothers in their sweeping skirts, the kids contingent with their lightning feet and the flag bearers, picked from the neighbourhood’s ordinary youth and transformed, for this one night, into kings and queens. 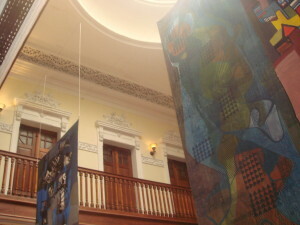 Each school has a theme which ties the whole gigantic spectacle together. Themes are expressed through countless floats, each one a giant extravaganza with its own brilliant (and significant) show and up to 55 different groups of characters and creatures, all pertinent to the theme and all in dazzling costumes which in some way underscore it. 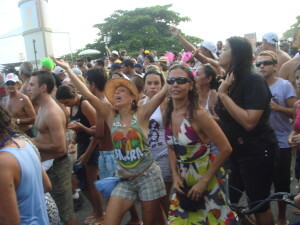 The school’s samba enreda, or especially composed samba song, which accompanies the spectacle (and to which performers and audience alike dance and sing along) also re-states the theme. So does the choreography. Some themes are simple,others are deep and meaningful, others are local, others, again, are universal and some are simply ingenious. 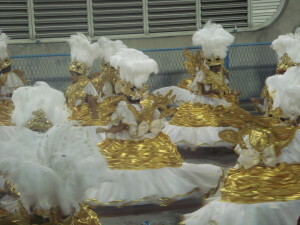 The Carnaval competition is tough and every minute detail of the performance counts -. theme, floats, costumes, choreography, music, animation, spontaneity, crowd engagement and last but not least timing. Every school must complete the procession through the Sambadrome in no less than 65 and in no more than 80 minutes. Carnival is not for the faint-hearted. Beginning at 9pm when the first fireworks light the sky and the first notes of the samba hit the air and ending at 6am when the last officials samba through the g-string framed buttock-shaped exit arches of the Sambadrome, it’s an all-nighter on full alert – with eyes, ears, voice, hips and feet engaged at all times. In Rio, Carnaval has begun. The Mayor has handed the keys of the city to Momo, and crowned him King of Carnaval. According to local legend, this maestro in top hat and tails was the god of mockery in ancient Greece until he offended Zeus and was banished from Olympus. He was re-born in Rio, centuries later, as the god of Carnaval. Every year, before Ash Wednesday signaled the beginning of Lent, he unlocked the city and unleashed three days of revelry. He overturned order and threw out routine. He freed the slaves and called a halt to work. Everyone took to the streets for the Carnaval Parade; slaves dressed as royalty and the rich dressed as paupers, men dressed as women and women as men. There were street dances. There were masquerade balls. It was Carne Vale or farewell to the flesh; a time to feast and enjoy because six weeks of abstinence lay ahead, a time to run free and make merry before another year shackled in drudgery. Today, still, once Momo holds the keys, the serious work of Rio goes out the window. The festivities that have been gathering force for weeks erupt in a celebration that brings the whole city to a standstill. Everyone packs up to party. Although slavery and the Lenten fast are things of the past, the spirit of Carnaval remains the same – set yourself free, party and have fun because in a few short tomorrows the holidays are over, work resumes, school starts, the summer ends and the dreary routines of everyday life close in. The traditions of Carnaval are much the same too – just bigger and bolder with all the scope and freedoms of the 21st century. There are hundreds of masquerade balls now. The Copacabana Palace Hotel’s Magic Ball, where the global glitterati turn out in luxurious masks and costumes, is the certainly the biggest. The Gay Costume Ball, where the exotic and outrageous make spectacular entrances, then dance the night away while the TVs of the world watch, is certainly the boldest. But there is just as much fun to be had at the Samba Schools’ Balls, with the drummers, the sambistas and the schools’ big stars, in nightclubs under the arches of Lapa or at the street dance in Cinelandia, in Sambaland, the Carnaval village near Praca Onze. or at the simple neighbourhood bloco. This weekend every favela and suburb pulses to the beat of the samba. Rio de Janeiro is famous for its beaches. Most famous of all is Copacabana, star of a billion photos, setting for innumerable movie scenes, subject of countless songs and favourite haunt of tourists and Carioca (people of Rio) alike. If the statue of Cristo Redentor represents Brazil’s conservative Catholic soul then Copacabana beach represents its totally unabashed body. Its wide golden sands are domain of the bronzed, the bold, the beautiful and the not quite so beautiful, in bikinis that are barely there. The body beautiful, and even not so beautiful, is high maintenance and from dawn and dusk, thousands of Carioca jog, bike and skate along the pavements of Copacabana. Thousands of others tan, or belt volleyballs over nets on the sands. Some swim and surf the waves. On the weekend Copacabana is a city of beach umbrellas and deck chairs. Business booms in tent cafes and chairside peddlars ply everything from ice-creams to colouring books. For millions, locals and tourists alike, the year begins and ends at Copacabana, with one of the world’s greatest New Year parties. Fabulous fireworks light the sky at midnight and big name bands play through the night. The beach police, in runners, shorts and caps, keep Copacabana safe at all times, doubly so at New Year. 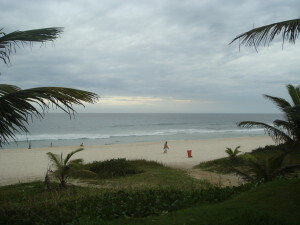 But Copacabana is more than just the stretch of sand that runs from Posto Dois or Lifeguard Tower Two to Posts Seis. At either end of the beach are two historical forts. At the north end Fort Duque de Caxias, was built in 1779 by the Portuguese colonists. Fort Copacabana, at the south end, was built in 1914 and went down in Brazilian history in 1922 when 18 officers (Os 18 do Fort) mutinied. Today, a giant ferris wheel turns above the old fort building which houses an army museum and the Café do Fort, an institution among Rio Cafes. The fort looks back across the beach to the promenade. Here is one of Copacabana’s most striking features and one that has come to symbolise the beach – the black and white mosaic pavements in the pattern of stylised waves. At the north end of Copacabana’s promenade, a Feira Hippy, or hippy market, does a roaring trade in crafts, art, food and souvenirs, including pareos, printed with the famous Copacabana wave pattern. Apartment buildings, restaurants, clubs, bars and hotels line the promenade. Star among them is the stunning Copacobana Palace, an Art Deco icon built in 1923. Here Fred Astaire and Ginger Rogers made their dancing debut in the film Flying Down to Rio. Today, the red carpet still rolls out for celebrities, royalty and the fabulously rich. But while there is extreme wealth in Copacabana, there is also extreme poverty. 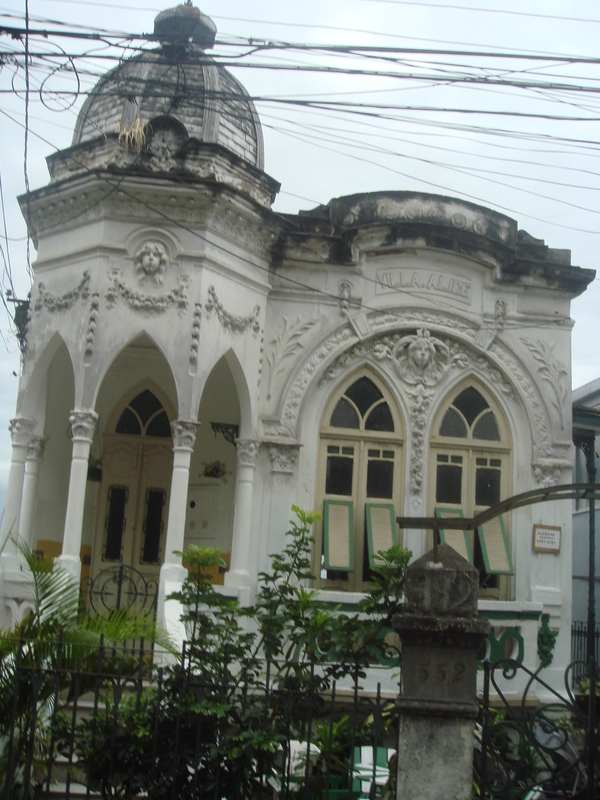 While there are streets lined with opulent apartments and de luxe hotels like the Copacabana palace, there are also favelas or shanty towns like Morro dos Cabritos, Pavão-Pavãozinho, Chapéu Mangueira and Babilônia Leme. High walls and heavy security defend the former from the latter. In this, Copacabana mirrors Rio and even Brazil. The beach, however, is another country, open, boundless and free and Copacabana is just the beginning of miles of glorious coast and many more stunning beaches.